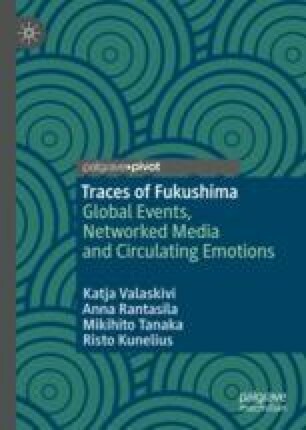 This chapter examines the Fukushima Daiichi nuclear disaster through circulation of affect in a hybrid media environment. Using the news coverage of potassium iodide tablet buying sprees in the Northern Hemisphere in March 2011 as its case study, this chapter examines how affect sticks and circulates in the news coverage, as areas outside Japan anticipated and speculated about the possible nuclear fallout from Fukushima Daiichi. The chapter introduces the notion of affective discipline and uses it to illustrate how distinct cultural tropes are used to manage circulation of affect during a crisis. Moreover, this chapter suggests that acts of affective discipline render visible the dual role of the public in crisis reporting: represented as panicky but addressed as rational. Anna Rantasila is main writer of this chapter. Rantasila, A., Sirola, A., Kekkonen, A., Valaskivi, K., & Kunelius, R. (2018). #fukushima five years on: A multimethod analysis of Twitter on the anniversary of the nuclear disaster. International Journal of Communication, 12, 928–949. https://doi.org/1932–8036/20180005.